Blue topaz meaning is said to be a modern version of a December birthstone. When gifted to one's partner, the meaning of the blue topaz symbolizes eternal love and faithfulness. It is mostly not used as an alternate birthstone for any other month. WOW! What a superb Vintage Offering presenting in As New condition! This is so much nicer than the pictures suggest with the gold having a rich yellow hue. It is comprised of oval shaped crimp-set links inset with pretty pale aqua blue crystal-like rhinestones/faux topaz. They alternate with fancy ribbed joiners. The stones are oval cut and beautifully facetted. They are clear and fabulous! It has a spring bolt clasp in perfect working order as well as a safety chain, an indicator of quality. It has the silky smooth feel usually only associated with solid carat gold and expected of quality antique/vintage jewellery. It has a soft gold hue. 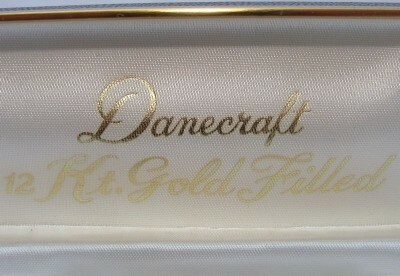 Maker: Danecraft Incorporated, established by 1939 and known as foremost designers of quality sterling and gold jewellery. MINT Vintage condition! There are no flaws to mention – it appears to have never been worn. The stones are clear & sparkling. A Gorgeous vintage bracelet on the wrist and perfect for Gift Giving! A fabulous addition to any jewellery collection - Why not treat yourself?